If you don’t know what an all in one card is, I’ll give you a quick rundown. It’s basically a card that can act as any card (e.g. credit, debit, loyalty, gift, ect). You simply select what card you want it to be, either on the card itself or on a companion app, then swipe it. It’s an ingenious idea! Ever since I first heard about them, I was intrigued. 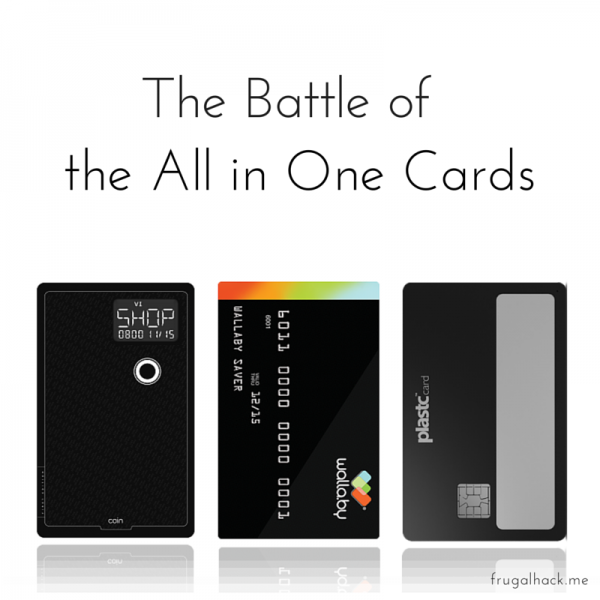 I love the idea of carrying only one card versus a wallet full. Also, they’ll likely be very helpful for manufactured spending, but we’ll get to that in a minute. As a precursor to this post, none of these cards are purchasable yet. It’s unlikely, but they could change significantly when they are actually released. This post is just a comparison of what we know about the cards at this time. For whatever reason, Coin is probably the most talked about all in one card. It could be because they originally planned on launching last year, but who knows. Anyway, at this point, Coin is basically an entry-level all in one card. It does not have chip and PIN technology, so it isn’t necessarily intended for international travel. It doesn’t have a rechargeable battery, so once the battery dies, you’ll need a new Coin. And it only holds 8 cards on the actual card itself. That may be enough for most people, but the points and miles community could definitely benefit from more. Coin isn’t all bad, though. It’s battery lasts 2 years, so you won’t have to think about charging it and you’ll likely be upgrading to a new version of Coin when the battery does die. In addition to that, Coin is about $40 cheaper than Plastc (after taxes and shipping). So, if you don’t want to spend $155 on Plastc ($135 after the coupon), then Coin might be the option for you. For what it’s worth, I originally had a preorder for Coin when they ran an intro $55 preorder offer, but I cancelled it last month due to their delay in shipping. Also, I felt like I had preordered an already aging technology due to the lack of EMV support. You can find Coin’s FAQs and preorder form here. Plastc is the leading all in one contender at this point. The card has chip and PIN technology, NFC, Bluetooth, it’s waterproof, and it can hold 20 cards at one time. That’s a lot of features packed into a small, credit card sized, piece of technology! The only issue with Plastc is that you have to charge the card every 30 days. I don’t know about you, but I’ve never taken a card out of my wallet to charge it. It may be a challenge to remember that, but I’m sure there will be some sort of phone notification to remind you. I’m also a little nervous that Plastc will move its release date back, as Coin has, due to technical issues, but I’m crossing my fingers that that won’t happen. If you are interested in preordering Plastc, you can do so here. I will receive a $20 Amazon gift card if you sign-up through that link and you will receive $20 off Plastc. You can find Plastc’s FAQs here. Wallaby is a bit different than both Coin and Plastc. Wallaby isn’t supposed to be an all in one card that gives you the option of choosing what card you want to use. Instead, when you swipe the Wallaby card, it will automatically charge whatever credit card of yours earns the most rewards at that particular store. This sounds like an interesting concept, but I like to be in control of my cards. For example, if I was trying to hit a spending requirement on a card that earns only 1X, I would use that over a card that earns 5X. Wallaby likely wouldn’t know that and it would charge the 5X card. Of course, that’s all speculation, because Wallaby hasn’t released much information about their card. So, we’ll just have to wait and see how their all in one card works out. As a side note, I would highly suggest checking out their free app (if you haven’t already. Wallaby does not have FAQs or a preorder page, but you can sign-up for their beta list here. So, which card is best? At this point I’m leaning towards Plastc, but realistically we won’t know until they all come out. And it seems like that may be awhile due to multiple technical delays and other complications. Do you have any of the cards preordered? What do you think about them?